Interesting Facts: Buneary are able to deliver powerful blows with their curled up ears - The force to which they can be extended can even shatter large boulders. They also have impressive jumping ability. When it senses danger, it perks up its ears. On cold nights, it sleeps with its head tucked into its fur. 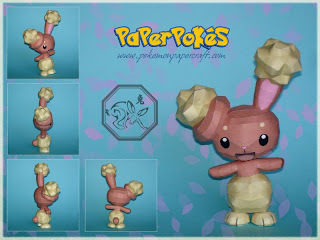 Buneary can only be found in Eterna Forrest. However, it is sometimes found with a Chople Berry. It evolves into Lopunny via Happiness. NOTES: Since we, at Paperpokés, don't envision ourselves being around for the next twelve years, we thought that we would complete the Chinese Astrology series (that we began last month with Growlithe) by publishing one Zodiac Pokémon per month. 2011 is the year of the rabbit. This model IS hard in certain places - the bumps and lumps that make up the puffs on the ears and around the lower part of the body are tricky, and referring to the .PDO is essential. Build by numbers, and try not to loose your patience. Glue head onto completed body, and then place it in a stable standing position on the completed feet. So cute! I never thought Buneary could look so good! ( I don't like it) Nice work you guys! are they really hard to make? This one, even though the ear was challenging, surprisingly not too hard, and VERY FUN!